My original recipe for San Choy Bow made with pork mince was typed out on a scatty bit of paper and given to me by Mr.Bradfield, that scandalously expensive butcher at Oriel Park. I have no idea why he gave it to me, since I bought meat from him very rarely. The scatty bit of paper has long since disappeared and of course, we have all since realised that San Choy Bow should be made, not with pork mince, but with cooked duck meat as part of Peking Duck. So pork San Choy Bow is probably not authentic, (although the Thais do have a similar recipe also made with pork and served wrapped in lettuce leaves, called Issan Ground Pork.) Nevertheless San Choy Bow is a welcome relief from the boredom of normal meals. Kids, if ever any of you remember to have any, think that eating their meal out of a lettuce leaf is just great. 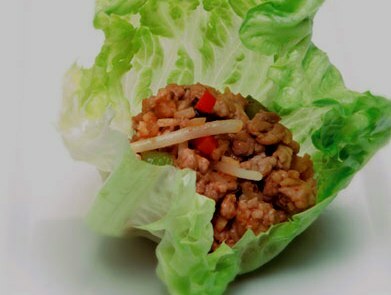 San Choy Bow is just as good made with chicken mince or finely chopped duck meat. Fresh young lettuce leaves, preferably iceberg, to serve. To separate the lettuce leaves so they don’t tear, use a knife and remove the stalk of the lettuce and run cold water into the lettuce for a minute. Soak the lettuce in cold water for an hour, then drain, cover and chill until ready to serve. This will ensure its texture remains crisp. Heat oil in a wok, add garlic and ginger and cook to release the flavours. Remove garlic and ginger with a slotted spoon. Add minced pork to the oil and cook, stirring until all the mince has changed colour and has broken up. Add green onions, water chestnuts and chilli stir through. Add chicken stock and cook, uncovered until pork is cooked. Add the soy sauce, oyster sauce, sesame oil and shaoshing wine and stir well to combine. Allow the mixture to reduce and thicken a little if necessary. cornflour has glazed all of the pork and the mixture has thickened. Transfer to a serving dish with another platter containing fresh young lettuce leaves. Guests take a lettuce leaf, place a spoonful of San Choy Bow, in the leaf, wrap it and eat it as finger food.